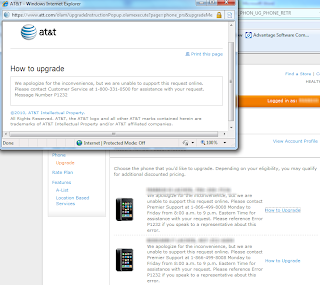 All started last night, when i thought i can pre-order the iPhone 4 at AT&T as a value customer. But unfortunately any upgrade attempt failed when to select the iPhone I wish to have. They had still only the 3GS option (I am a proud owner of the 3G version). 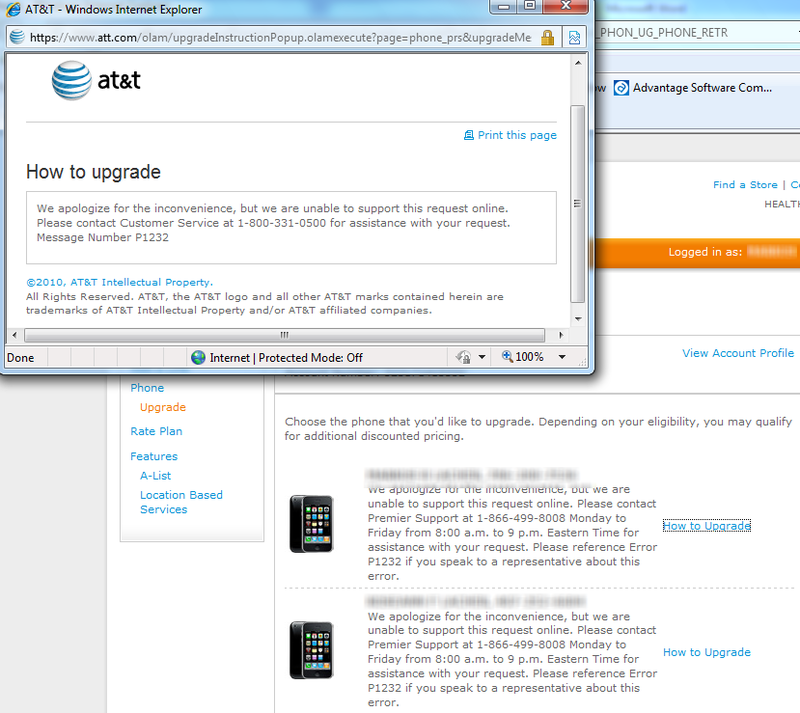 Logged into AT&T – still no options to upgrade to iPhone 4. Last check before I take my plane, but still no possibilities to pre-order at AT&T. Finally landed at my destination and first thing is to try to pre-order. Could finally choose IPhone 4 16GB for $399.00 and could keep the unlimited data plan for $30 a month. But AT&T website is slow, took tons of attempts till I finally could put my credit card information in. 2 hours for 1 phone, I still have to do my wife’s upgrade. I hit submit for the first one – page freezes, error message after 5 minutes. Tried again, could even not get to payment page. Called AT&T sales department, they told me I can’t order over the phone I have to do it online or at an AT&T store. Told him online does not work, he told me AT&T is aware of it and will soon work again. After calming down, I try again to order, now the page is much faster but not upgrade option at all, only a info button "how to upgrade", pop up comes and stated that this upgrade function is not possible right now. I called the number but a voice tells that too many calls are coming in and AT&T can't take the call right now. I shall try later again. Looked up nearby AT&T address and I took my car, got lost but finally found store. A line of 10 people are there to pre-order the IPhone. This is a big line in consideration that I am in the middle of nowhere in a very small town. pre-order with real credit card, otherwise their system would charge my card when pre-ordered and when shipped. I had no luck, to be one of the first. I will try again later tonight. If it does not work, I have to wait till the 24th. I hope I survive with this uncertain future. It seems the whole world did want to pre-order the new IPhone 4 and AT&T did not expect this. Pretty poor and I am sure the customer ratings are going more down for AT&T. I keep posted if I have more luck the next time. Till then a frustrated wonna have IPhone 4 owner.